It’s time to look at a racing game that I have had on the backburner for a very long time. I’ve always been a big fan of racing games although admittedly the one drawback to the genre is that the CPU racers can seem a little cheesy at times. On the other hand, it’s a little hard to see how to nerf that. It’s very hard to make the computers appear to be fair or they may seem too weak. Still, this one doesn’t do a bad job of it. I do think that the star requirements to unlock the various worlds are a little steep though so don’t count on unlocking all of the different tickets (worlds) unless you are prepared to play this game’s levels over quite a few times. The gameplay is probably obvious from the cover but it’s a racing game. You try to drive to the goal as quickly as you can and lead the pack. Each race is 3 laps and the duration varies, but most levels are roughly 4-5 minutes. You have a boost which you can use quite regularly but give it a little time to recharge or it’ll overhear and effectively blow up. That’s really the only gimmick here as it’s a normal driving game otherwise. That definitely works for me. I don’t mind the boost and if anything it can be fun to have. Racing games with items have their place as well considering that Mario Kart Double Dash is probably still the best racing game. At the same time, sometimes it’s great to just hop in the car and use nothing but your skills to reach the end. The main mode here is the campaign. There are a series of tickets which grant you access to a group of races ranging from 1-4. Winning each race will give you some points depending on if you placed in 1st, 2nd, or 3rd. Gain enough points and you unlock the next ticket. There are 21 tickets, but to unlock all of them you will need a significant amount of 1st place finishes. Most likely you may get around 10 tickets unlocked, but of course if you are willing to put in the time you can go farther. There are also free races and the like to play through. Conquering all of the races will take a significant amount of time so the game has a lot of replay value. In general, I feel like racing games are often very good at this. You really get the value that you’d expect from a game like this one. The sequel looks pretty interesting as well, but at the same time I do think that the racing genre is often one that you don’t want to overstay your welcome in. Best to take it slow and simply enjoy the races that you’re in. One thing that the game does to make itself stand out among the crowd is by having a full soundtrack. It has a wide range of lyrical songs and they are all loud, fast paced titles that really make you feel the intensity of the race. I can’t vouch for the lyrics of the songs, but at the very least the beats are pretty solid. The developers understood what kind of music would be really fitting for this genre. The graphics also look pretty good although there isn’t much to say about them. They look like what you would expect, but aren’t any better or worse than that. They are simply standard and I’d say that this is good enough. Another area where the game did a good job was with making each vehicle feel different. 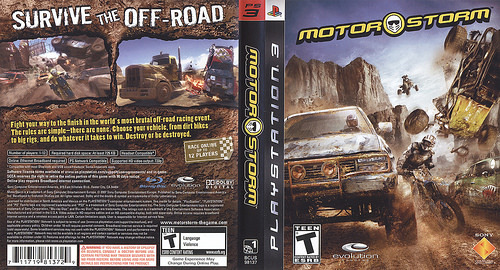 You can play as a car, buggy, motorcycle, or a large truck. My favorite one is easily the motorcycle as you really zoom by there and the turns are really smooth. Of course it is sad to get completely knocked over if another vehicle so much as touches you. That’s the price for being light though and I’m used to it from playing Sheik in Super Smash Bros. It does make the campaign a little harder though since every other race has you switch styles so it is hard to get used to any one version. It’d be nice if they had separated them from the start so you could take your time and master each one. The crashes are definitely a lot of fun in this game. Some racing titles certainly give more emphasis to the crashes than others and this is definitely one that had a lot of fun with the animations. You crash in slow motion and seeing the driver get slammed out of the car never gets old. Occasionally you do have to wonder why the cars are so weak though. Just going too fast on a muddy surface will cause you to tip over. The worst situations are where you don’t blow up though. At the very least you want to be eliminated right away so you can respawn. Sometimes you will simply be stuck upside down so then you have to try boosting to blow the car up intentionally. However, this takes so much time that you may as well give up the match at that point since you won’t really have a chance at first. Finally, I enjoyed the level designs quite a bit. You have a lot of freedom to explore here. The levels are huge and there are many different paths to take. Part of the fun is picking a path and hoping that it is the optimal one. There is no way to find out except for trial and error so it encourages multiple playthroughs. I ultimately prefer linear tracks, but this makes it feel a lot more like a real outside race. I can certainly appreciate the attempt here since MotorStorm doesn’t exactly feel like a friendly Mario Kart kind of exhibition here based on how violently everyone crashes. It’s a bunch of races to the death for sure. Overall, MotorStorm is pretty fun. The gameplay is really good and it’s just fundamentally a good game. There is nothing weak about it and there is a lot of content to stay busy with. A story mode would be nice, but I can’t say that it was expected. If you are a fan of the racing genre then there is certainly no good reason not to buy this game. It just has everything that you could possibly want with it. The game isn’t very forgiving though so prepare for a lot of tough competition from the computers. You may not win the races in one try, but find the fastest route and eventually you will be acing the competition. It’s all about practice, practice, and more practice.